Harrison's Bird Bread Mix is a premium, certified organic bread mix which can be baked at home for your pet birds. It can be used as a healthy alternative to home prepared bird food, and be offered instead of table food. Harrison's Bird Foods (Adult Lifetime Coarse & Fine, High Potency Coarse & Fine), Grey Millet, Sweet Corn, Baking Powder, (aluminum-free) calcium carbonate. Crude protein (min.) 14%, crude fat (min.) 9%, crude fiber (max.) 5%, moisture (max.) 10%. 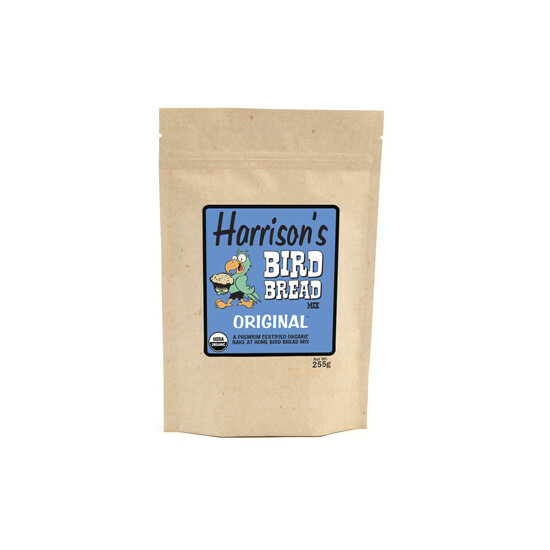 There are currently no questions for Harrison's Bird Bread Mix - be the first to ask one!